Connect you to Place & Within! Unbeaten Path Tours & Yoga offers turnkey solutions for private and corporate groups. Our services are based on the wisdom, systems and models as witnessed in nature and the technology of Kundalini Yoga. guests gain a new found WISDOM and respect for place and leave with a more meaningful connection within. What we offer and why it counts! We provide you an Experience of place that stays with you on your journey & forever. A comfortable timeline that lets YOU be YOU to make your own discoveries. Authenticity - what we share comes from the heart and resonates within us personally. We create a bond. A mindfulness session atop the pews of our rocky coast as whales stroll by make for a perfect completion to any corporate or private tour. Our Unbeaten Tour Experiences provides a unique perspective on Nature, Oceanography, Landscape & Architecture where guests witness first-hand the interconnection and wisdom of nature and how it applies to our behavior in life and the environment. In addition, our specifically designed BUSINESS SOLUTION TOURS help businesses connect and identify with the facets of problem solving, evolving through action, managing sustainability and creating a TripTic for Success as witnessed in nature, the landscape and in architecture. SO POPULAR! Now offered YEAR ROUND! ​Owner & Guide of Unbeaten Path Tours, Margaret Lindgren, is also a certified instructor of Kundalini Yoga, an ancient yogic technology founded on the principle of combining the physical with the meditative. Margaret offers exclusive workshops, classes and retreats geared towards specific goals for both the private and corporate sectors. Unbeaten's Yoga & Nature Tour experiences are the perfect marriage for a true wellness getaway and retreat from the stress of urban life and work. See below links to our top 3 rated tours! featuring owner & guide, Margaret Lindgren! What's the difference between walking the trail on your own or taking a tour with Unbeaten Path? My response: Would you rather read a sheet of music or hear it played in all its splendor at the symphony? Our tours add depth and connection to place. 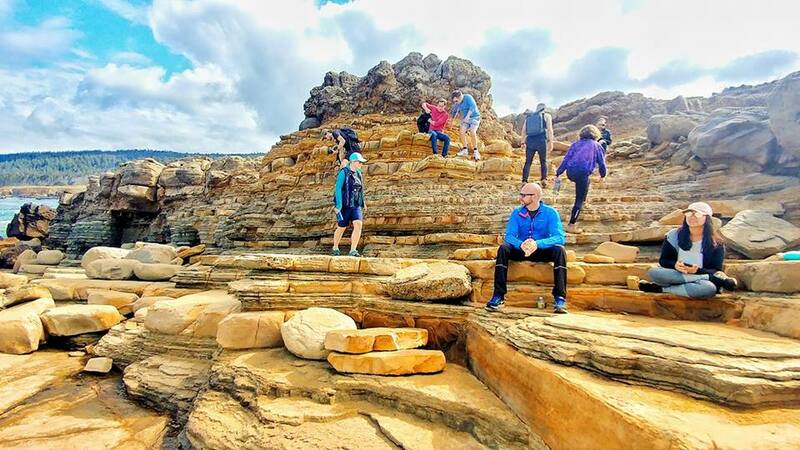 At Unbeaten Path Tours we "Connect People to Place" with our private & personalized walking-nature tours. We bring guests to specific and unique areas they would otherwise miss if going it alone and we share with them aspects of the region that resonate with us, such as history, geology, the marine ecology, birding, local flora, little-known facts and more. We share our passions with our guests and we find this is very contagious! Not only do our guests gain a new found knowledge, appreciation and respect for the lands, our ocean and ecology - they leave with a more meaningful connection to place ... and the desire to return! We offer personalized, private tours to meet your needs. We do our utmost to secure a tour time JUST FOR YOU. We are, literally, your "boots on the ground" visitors center. Want to know what you can do in the area? We can help. View Our Tours page for details on each of our offered tours and the Point Arena Stornetta National Monument Tour. ​Are you a Corporate or Wedding Group? Please be sure to contact us directly for pricing and tour options! and to offer our skills & abilities as a resource for our guests and our region! We seek to share our knowledge, to connect our communities and businesses and to be an integral part of an ever evolving collective! Are you in? Come join us! Ask us about them and how you can be involved! The Farallones Marine Sanctuary Association! The California Native Plant Society! CTA certified through Sonoma County!